Super7 Operations uses small teams of 5-9: average 7 persons. Why did we chose this team size? The optimal team size for Lean working – a question that keeps popping up. In several recent publications on SCRUM (e.g. articles on Scrum.org or informit.com), an optimal team size of 7 plus or minus 2 (that’s 5 to 9 to you and me) is mentioned. Stephen Robbins, author of Essentials of Organizational Behavior (2005), a best-selling textbook on organizational behavior, has concluded that teams of more than 10 to 12 people have a difficult time establishing feelings of trust, mutual accountability, and cohesiveness. Without these, constructive interaction is difficult. At the SPA 2009 conference, Joseph Pelrine told his audience that the sizes 5, 15 and 150 have been mentioned in (or can be derived from) scientific research, as being optimal sizes for social groups. To me, 150 sounds to big, and impractical for an autonomous team. And then there are people that are convinced that a team should have an odd number of team members, so that a democratic decision will always have a majority. And then there is the principle of social loafing, first demonstrated by psychologist Max Ringelmann in the 1920s when he measured the pressure exerted by individuals and teams pulling on a rope. Groups of three exerted only two-and-a-half times (not three times) the average individual pressure. Groups of eight exhibited less than four times the individual average. 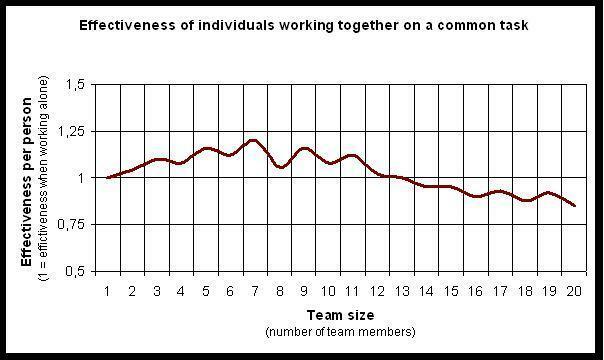 Ringelmann’s and related studies have shown that individual effort is inversely related to team size. But is effort the same thing as effectiveness, especially when the work is not so much physical but requires intelligence and judgement? My analysis, based on all of these sources and my own experience in Lean-teams, results in the following graph. With the introduction of Super7, we discovered that a small team of about 7 people works great. What do you think? This entry was posted in Lean, Operational Management, Teamwork & cooperative models and tagged Super Seven, Super7, Super7 Operations on January 2, 2013 by M.R. van Dijk.